Well I made it! The wedding was this weekend and it was a great success, but now I'm going to be terribly mean and make you wait until the end of the month to see the finished quilt! I know that's not very nice, but I'm too tired to do all the photo sorting this evening and I want to post some pictures from the wedding along with the quilt, so that will have to wait until I've got copies from my good friend Lou, who took some really lovely shots on the day. 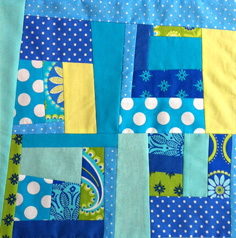 In the meantime I'll just show you a couple of pictures of the back of the quilt... I really would never have managed to complete this quilt without all the wonderful resources I've found on the web and all the amazing bloggers I've been following. I normally don't do a pieced back but there was no wide fabric I could find that would suit. So I kept the pieces very large and made an abstract pattern that was seven squares by seven. 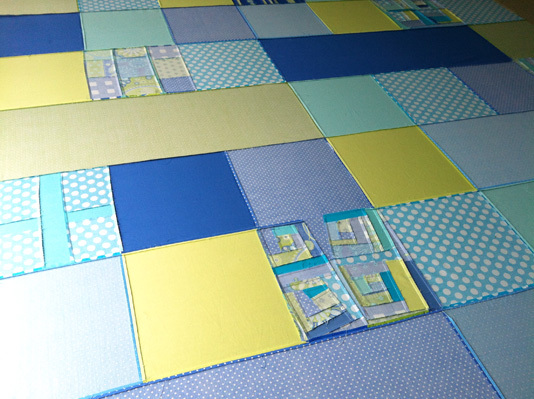 I knew I didn't have enough large squares, but I absolutely refused to buy any more fabric when I had so many scraps and bits and pieces leftover from the front. So, I made one square in each row in a random pattern with ideas I've collected from the web over recent months. That's my twist on a mod mosaic patch at right. I did a couple of these on the back. 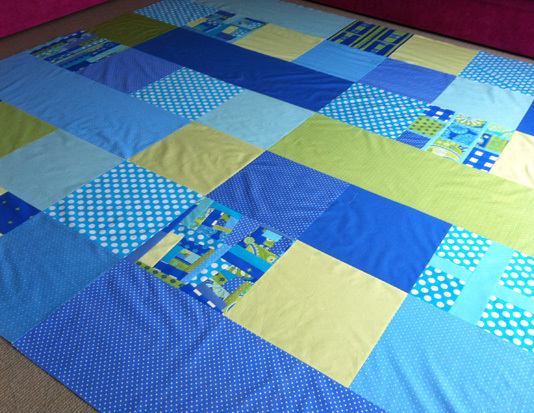 The pic below is the quilt back face down and stretched ready for layering and pinning prior to quilting. I couldn't resist taking it because I thought it looked like farmed paddocks from the air – a bit like this. Maybe I'm dreaming of my next overseas holiday? Stay tuned for the big reveal in the next couple of weeks! This is beautiful! Great job. I can't wait to see you finish. Thanks Lacosta. The 'finish' pics will be up soon!